For those of you who know us personally, you know that we have been in love with The 1975 for some time now. So this post (and future ones) was kinda inevitable. The 1975 have been around since 2002 under names such as: The Slowdown, B I G S L E E P and Drive Like I Do (their new… but old project) – but have only recently garnered such (well deserved) attention in the past few years. Once the Manchester band finally signed to Polydor UK/Dirty Hit they hit mainstream radios across the pond. The band consists of: Matty Healy (vocals & guitar), Adam Hann (lead guitar), Ross MacDonald (bass) and George Daniel (drums) who came together to play a gig put together by their “idealistic hippy council worker”. Since then they’ve released four EPs, a self-titled album that has debuted at #1 across UK charts and their second album (I Like It When You Sleep, for You Are So Beautiful Yet So Unaware of It). They’ve also stacked on a few more members. 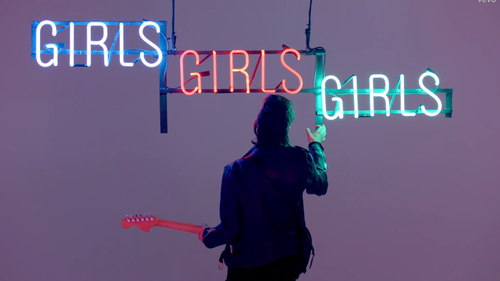 Healy has been quoted saying they draw their musical influence from various places such as Michael Jackson, motown, The Rolling Stones, Brian Eno, Sigur Ros – even calling their genre “guitar’n’b”. 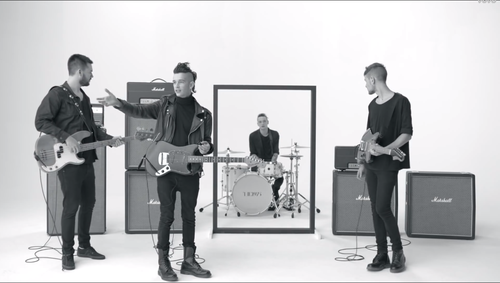 This fluid sound is what caused them so much trouble early on trying to get signed, receiving negative feedback such as: “You don’t know who you want to be, ’cause all your songs sound different from one other and you don’t know what you want to do.” However their adaptive sound has allowed them to go on tour with: The Neighbourhood, Bastille, Muse and Montreal’s own Cruisr. The reason why I picked “Girls” for this post is because it was one of the videos that I had showed Alia early on. It’s catchy pop tune and eloquent lyrics made me fall hard for music again. At the beginning it was just about their only video that was in colour – as “a tongue in cheek” way to show them “selling out” and changing their iconic style of black and white. Dressed in black from head to toe is always option. Keep it “not pop” by throwing in some stompin’ punk boots and leather accents. Mix up the textures to keep the outfit from looking plain. Where’s the fun in doing what you’re told? Here’s a perfect example of another all black outfit that gives off a completely different lewk because of the cut and detailing. Stay classy and work those high heels! To me, wedges are so much easier to walk so you can keep the party going all night long. Plus you won’t sink into the grass at a BBQ or pool party. Keep the vibe of summer fun around with a pop of bright pink lipstick and neon sunglasses. MORE BLACK ♥ Step up that black blazer by looking for ones with zip, trim and even lining details. The cut is also important for example, if you’re going for a more casual look then rock the middle look. Also blue mascara, tried and true, is a definite conversation starter. Another idea perfect for fancier occasions or hanging out with the girls. Floral can easily be worn for this look as long as it’s on a darker background or if it’s a nice fade. Even floral accessories like those sunglasses work. Each of these monochrome-y outfits are good for rating casual to dressier. Although each are quite simple – clothing wise – the accessories make the outfit like that statement necklace or those metallic heels! Black and white stripes will always have a place in my heart. I like to keep the palette classic by sticking to black, white, red and silver. Make your nails match your lips just because you can! THE ACTUAL DRESS IN THE VIDEO IS GORGEOUS but these are the next best ones. Red lace is perfect for the holiday season and what else goes better with it than gold accents? Find a pair of royal purple pumps to show everyone who rules. Other than the all black outfits, I would wear any of these any day. Just like florals, neon can be paired with a darker colour (like BLACK!) to make them pop even more. 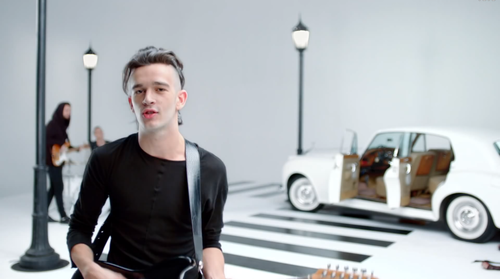 What’s your favourite music video from The 1975? Comment it below!